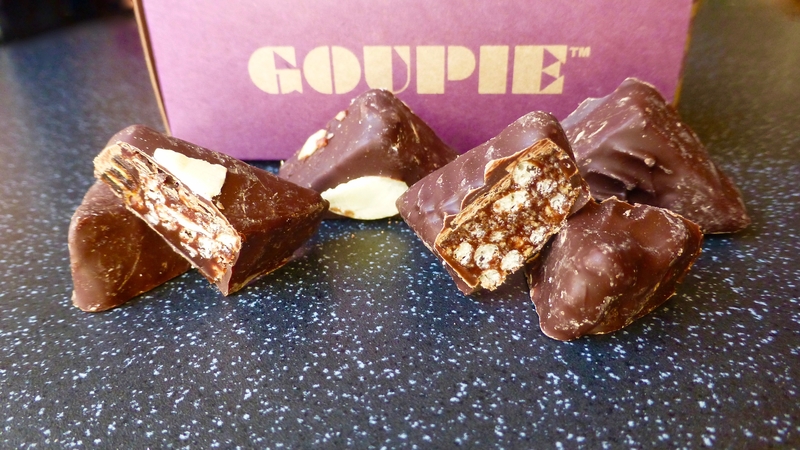 Having never come across Goupie or even heard of them you, you could say I am a Goupie virgin. A few weeks ago these geometric style printed boxes came through my door after the lovely Grace from Goupie kindly sent me some to try. Based on a genuine family recipe there are plenty of flavours on offer from your standard Orange, Mint, Ginger and Hazelnut, to your more eccentric Dark or White Chocolate Lavender and Cardamon and White Chocolate. I for one chose two of their other flavours – Original*, because nothing beats the natural form, and Cherry & Almond*, because my love of Cherry Bakewell. From the angled boxes, to the funky prints I am in love with the packaging. Inside each box is a clear packet filled with the Goupie chocolate of your choice. The only thing that caught my eye packaging wise was on both, the sealed bags had been pierced and the chocolate was spilling out. Each box comes in at £4.00 a pop, the Original is dairy free and vegan friendly and the Cherry & Almond is vegan friendly and gluten free. These wee triangle pieces were the perfect bitesized pieces. I wasn’t at all sure what to expect but in a nutshell bloomin delicious. The Original was exactly as it suggests. A mix of bitter dark chocolate married with a real sweetness which I assume is from the golden syrup, together with the abundance of crunchy chewy pieces, I was impressed. The Cherry & Almond first and foremost had a delicious chocolatey cherry aroma that makes you want to chow on down. 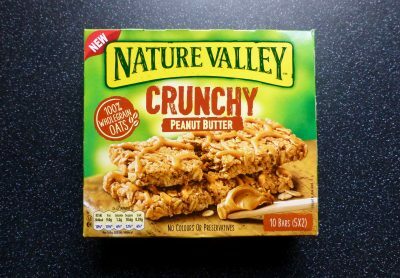 Despite the appearance of layer upon layer, this was smoother and less crunchy which I preferred and made these totally addictive. The cherry flavour was fresh and the almond slithers gave the perfect nutty taste, however I did find that some had more of an intense flavour than others, which let the side down slightly. That said when it hit the flavour mark, the delicate balance of flavours was spot on and proves there really is no better pairing. It’s safe to say I can wave my hands in the air like I just do not care, I am a Goupie Fan! Of the two I am always going to pick the Cherry & Almond and is the one I am going to recommend to you all if you want to chose just one. However with all the flavours on offer as well a seasonal ones, I am sure you won’t just pick one! *Thank you Goupie for sending me these two flavours to try. Ooh they sound lush! I’ll have to keep an eye out for those in the chocolate aisle.